The Year 1967 was a pivotal one for Bermuda. In late July 1967, after a period of Negotiations between representatives of the Progressive Labour Party and the United Bermuda Party, the Bermuda Constitution was legislated in the British Parliament in London. This provided the framework for a democratic Island, the culmination of years of grassroots campaigning to transform our society, guaranteeing voting and other fundamental rights, we often take for granted. During those same days in July ’67, of formalizing Bermuda democracy, in London, a group of Bermudians gathered thousands of miles away, across Canada, in Winnipeg. They were representing Bermuda at the 1967 Pan Am Games, a sporting festival involving athletes from across the Americas. July 2017 marks the 50th Anniversary of these parallel events. While the conclusion of the process in London in 1967, played out as expected; the results in Winnipeg, came as a pleasant surprise. 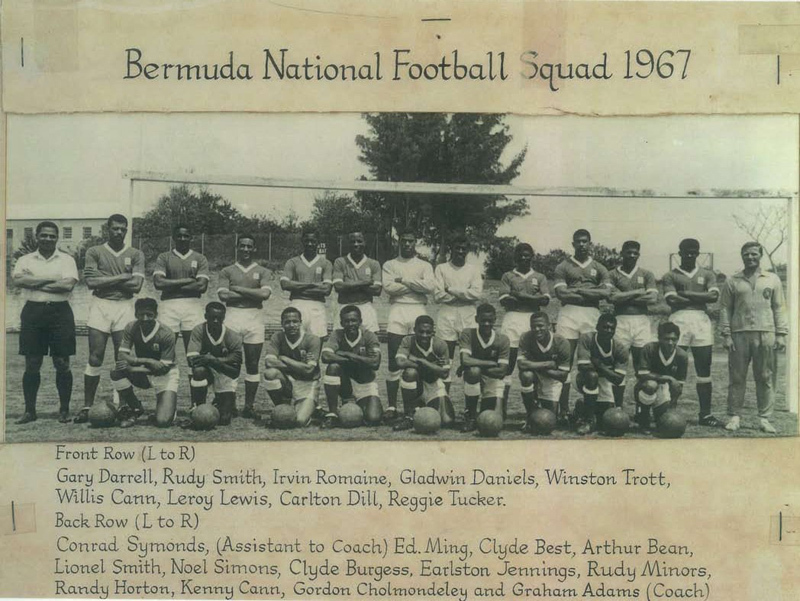 The Bermuda National Football Team and the representatives from sailing – particularly Penny Simmons – had ‘track-records’ that suggested that they would give a good account of themselves at those Games. However, to that date, no onion had medaled at any major international sporting event. Our National Football Team, managed by a progressive English coach – Graham Adams – included captain Gladwyn ‘Bubba’ Darrell and involved a squad of 18 players from various clubs; notably 6 players from Somerset and 5 from Devonshire Colts. The Pan Am squad included: Clyde Best; Kenny Cann; Willis Cann; Gordon Cholmondoley; Gary Darrell; Carlton ‘Pepe’ Dill; Marcus Douglas; Leroy ‘Nibs’ Lewis; Ed ‘Tinty’ Ming; Rudy Minors; Irving ‘Jack’ Romaine; [brothers ] Lionel ‘Baldy’ & Rudy Smith; Noel Simons and goalies – Clyde ‘Tango’ Burgess, Earlston ‘Duckfoot’ Jennings and Dennis Wainwright. ‘Bermuda’ sent a ‘message’, when in their first game, they beat the U.S. Team 7 – 3 on July 25th , 1967. Among the goals were ‘Pepe’ and ‘Baldy’ – two each; ‘Bubba’, ‘Jack’ and Marcus. With draws against both Cuba and Canada in subsequent games, Bermuda met Trinidad and Tobago on July 31st in the semi-finals. Thanks to goals from ‘Pepe’, Gary and the 16 yr-old wunderkind Clyde Best, the team beat T&T 3 – 1 and booked a spot in the Finals against Mexico; for whom football is a religion rather than a sport. On August 3, 1967 the Bermuda Team held Mexico to a 0 – 0 draw, up until the 87th minute, when Best headed a ball that hit the upright- just millimeters short of victory. In extra time the Mexicans over- powered our Byes to win 4 – 0. As a result of this game, Bermuda was awarded Silver Medals on that date and Match Officials formally recognized our team for Best Sportsmanship of the Tournament. Pepe had scored 5 goals in the tournament. That same week Penny Simmons was awarded the Bronze Medal for his performance in the Snipes Class of sailing. It’s arguable that our grassroots system of sports clubs had provided the foundation for that Pan Am success. It happens that Devonshire Colts, while a smaller club, through their founder Edward DeJean, had a mission for fostering youth development, but also actively supported the movement to democratize our Island. Wilfred ‘Mose’ Allen, a close confidant of DeJean was involved in those historic Negotiations in London. As a result of the new Bermuda Constitution being legislated in July 1967, Bermuda enjoyed its first fully democratic General Elections in 1968. That group of young men who gained those Silver Medals, demonstrated on the global stage, what could be achieved through team work, notwithstanding any ‘limitations’. Individuals took on further challenges – Clyde Best broke down barriers of race for top-flight football in Britain. ‘Pepe’, Gordon and Gary demonstrated that Bermudians could excel professionally in North America. That Silver Medal performance provided inspiration for those of us in that ‘60’s generation in Bermuda, reminding us of the power of teamwork – collaboration. As we reflect on the challenges facing too many of our young people today, this 50th Anniversary offers us lessons on which to reflect. Through careful consideration of that era of limited resources, we may find clues to optimizing the potential of this current emerging generation. Congrats to the Pan Am team of ’67!!! And thank u for highlighting this in ur column Mr Fubler..